Heat lost through your windows can be expensive to replace to the point of throwing money out of the window! Installing low emissivity (low-e) energy efficient windows supplied by Studley Glass can help to reduce your heating bills by up to 20% each year. Limiting the energy escaping and letting the suns energy flood in. Lowering the amount of energy you have to use to heat your property. Improve the energy efficiency rating of your house ready for resale. We offer a range of low-e energy-efficient glazing to suit every type of property, from a modern home to an older traditional styled home. 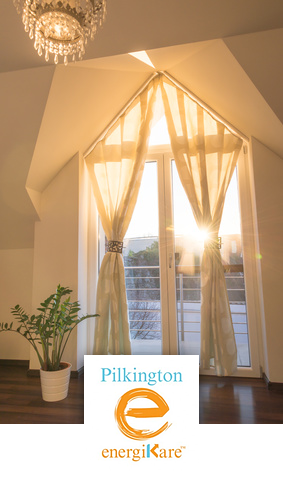 Pilkington energiKare™ is the name given to double and triple glazing used to improve the thermal efficiency of homes. 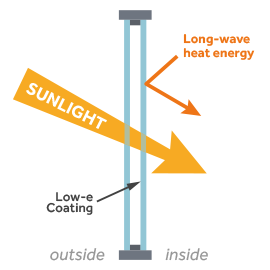 Low-e reduces the amount of heat lost through your windows and can also allow more heat energy from the sun in through the glass. This so-called passive solar gain provides additional energy free of charge. When installed in good window frames of any material; uPVC, timber or Aluminium, it helps to achieve the requirements of the latest Government Building Regulations for the energy efficiency of homes using either the Window Energy Rating (WER) scheme or by having a very low U-value.